theme: winter, old work, pchat with Yina. We were out of practice then and took like 5 hours over our drawings... ughh such a setback from when we were more prepared and turned out drawings in 1~2h. Beautiful ! Your skills are amazing. Il love it ! *starry eyes* pretty! I love Original walls.. if only I could draw! Well, I can, but.. not on the computer haha! The girl almost looks mischievous, and the aura of their setting is cold and curious. A story is told here! Really like the overall image and the concept, but if you look at it in full resolution you notice some really heavy pixelation and aliasing on the main figure. The painting looks unfinished in some places and the couple looks jagged, as if they were resized a lot. Except that, it's a great scenery of my favorite season. I seem to remember D. Gray Man from this. Stunning work! It's really beautiful! Thank you for sharing! woah~! O.O this is absolutely amazing! i love the calm colors n everythin! Very good work, I love that you left a big part of the wall for the scenery :) There is some jaggedness on the couple (especially the faces) but it's not too noticeable after being resized down a bit. Overall, great work, I love the colors and the characters' expressions. That's great! I love tender colours :3 thank you for such a work! 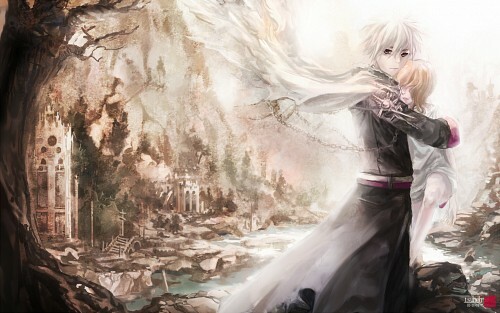 Beautiful work as always~ I LOVE the scenery. Nice but it is not so clear at all. Could you make it look better?